Super Pro just came out with a full line of Subaru BRZ and Scion FR-S performance bushings. 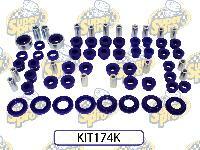 The Super Pro bushing kits will be everything you need to stiffen up the handling and performance of your FT86! Everything from control arm, to crossmember, to steering rack bushings and more. Also, released by Super Pro are their front and rear sway bars for the BRZ and FR-S. Check them out!